Unique and proven solution fort he storage of tissue, suitable for the pathology department. 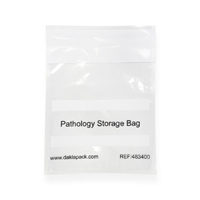 The storage bag is not only preventing liquids from leaking out, but also avoids being exposed to (toxic) gasses. The Pathology storage bag is an excellent alternative for storing in buckets and jars, saving both storage space and money.